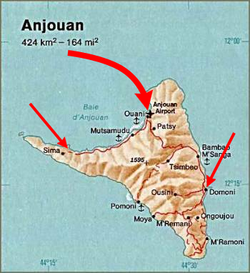 The invasion of Anjouan (code-named Operation Democracy in Comoros), on March 25, 2008, was an amphibious assault led by the Comoros, backed by African Union (AU) forces, including troops from Sudan, Tanzania, Senegal, along with logistical support from Libya and France. The objective of the invasion was to topple Colonel Mohamed Bacar's leadership in Anjouan, an island part of the Union of Comoros, when he refused to step down after a disputed 2007 election, in defiance of the federal government and the AU. The Comoros archipelago in the Indian Ocean has had a fractious history since independence from France, experiencing more than 20 coups or attempted coups. Anjouan (also known as Ndzuwani or Nzwani) is an autonomous island of the Union of Comoros. The island is located in the Indian Ocean. Its capital is Mutsamudu and its population as of 2006 is about 277,500. The total area of the island is 424 sq. kilometers (163 sq. mi. ).